Aluminium Doors are resistant to corrosion as they are coated with aluminium and not necessary to paint repeatedly. These are used for office, home entrance, terrace, factory, etc. It can be of different colours, patterns and designs. The doors we deal are made using high quality aluminium which makes them reliable, tough and long life function. These are widely used in hotels, Hospitals and offices. 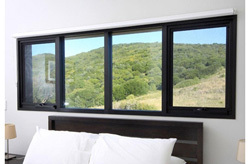 Available in different sizes, specifications and designs aluminium windows are widely used in the market. 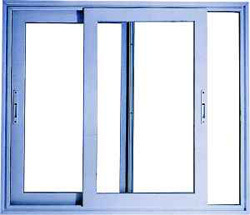 These are made from high grade aluminium which keeps windows resistant from corrosion, reliable and durable. These are used for creating office areas as for having privacy in doing official works. These means creating partitions used to divide the cabins of employees. They are available in various designs and sizes. Aluminium Partitions can be done in full glass or can be coated with aluminium sheet. The partitions are with smooth finishing, sturdy, excellent designs and are durable. These are a type of metal curtain wall system. Light weight composite panels are used to construct the panels. 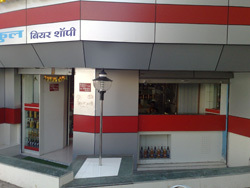 Aluminium Composite Panel Claddings which we deal are available in different styles, designs and specifications. It is a system of bonding glass to building’s structural framing using high strength, high performance silicone sealant which is designed for structural glazing. These are widely used in the industries because of there high strength, durability and dimensionally accuracy. Structural Glazing used for commercial buildings, corporate buildings and construction industry. It is an outer covering done for buildings in which the outer walls are non structural. In short Curtain Walls are used to give exterior appearance. It can be made of light weight material which helps to reduce cost. P.V.C. Floors are universal mats which you can use for any indoor purposes. Widely used as they are easy to use and are available in various shapes and designs. Vertical Blinds are made of thick Plastic. It is hung on the doorways of some homes and other businesses which generally leaves the door open. In warmer climates, vertical blinds discourage flies and some other insects from entering the building. MS Grill (Mild Steel Grill) is designed in such a way that it gives an elegant look to the décor. Due to there competitive prices, sturdy construction and high strength our products are recommended in the market and clients also appreciate. Established in the year 1988, we are engaged in dealing of Aluminium products for Architectural Works. We are one of the leading sources of Aluminium Doors, Windows, Partitions, Composite Panel Cladding Structural Glazing, Curtain Wall, P.V.C. Flooring, Vertical Blinds and MS Grill. 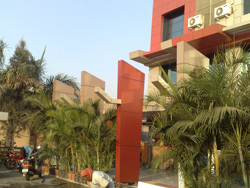 Our management team consists of experienced individuals who are well experienced to undertake projects of any size of architectural aluminium works with the most stringent quality control requirements at competitive rates. Employees working in our company are trained and qualified technicians and craftsmen to manufacture and erection at site of architectural aluminium contracts of the highest sophistication, quality and size. Customers highly appreciate our products because of the timely delivery, qualitative products and competitive pricing policies.